It can be a bit of a challenge deciding which piano to buy when you’re first starting out. Roland have an excellent reputation for building quality instruments and they have a few exceptional digital pianos for under $1500. 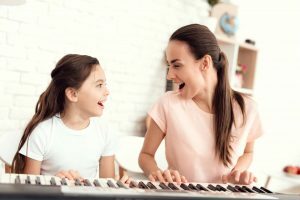 Why choose a digital piano? Digital pianos let you play anytime without disturbing your family and neighbours. There is no better way to improve your playing than to record your performances and then listening back to them. There are countless apps available that are designed to help you learn to play piano, no matter what level you are playing at! Almost all digital pianos come equipped with multiple piano sounds, harpsichords and electric organ sounds. They also never need tuning! Metronomes help develop your rhythmic and timekeeping skills. Adjust the digital click to help you stay in ‘time’ and also to master complex or advanced pieces of music. Before going into a piano shop, it’s good to have a pretty clear idea of what you’re looking for. With that in mind, let’s take a look at Roland’s pianos for under $1500, which have set the standard for pianos in this price range. Light and portable, it’s a great fit for performing players and music classrooms as well. Adding in numerous sounds beyond the piano, built-in practice and recording functions, and Bluetooth® wireless support for working with popular music apps, the FP-30 delivers a premium musical experience previously unattainable in such a streamlined package. If you’ve dreamed of having a digital piano for under $1500 in your home but don’t have the space or budget for a full-sized instrument, your wait is over. The affordable FP-30 offers Roland’s acclaimed sound, feel, and modern features in a top-quality 88-note instrument that fits any space with ease. Light and portable, it’s a great fit for performing players and, similarly, music classrooms. Numerous sounds are available beyond the piano, built-in practice and recording functions, and Bluetooth® wireless support for working with popular music apps. Consequently, the FP-30 delivers a premium musical experience previously unattainable in such a streamlined package. When you’re learning to play the piano, having 88 keys makes a big difference. The Roland RP102 delivers authentic piano performance and onboard practice features in a compact and affordable design. The RP-102 is filled with technologies derived from award-winning premium pianos, including a luxurious and supremely playable weighted-action keyboard. As a result, it provides inspiring sound and touch that will support your music as your skills evolve. With its streamlined cabinet and three integrated pedals, the RP102 offers a traditional upright look that fits nicely anywhere space is at a premium. Our digital piano takes pride of place in our living room and coming home to the sounds of someone playing always brings a smile to my face! It’s one of those things, like the smell of home cooked bread in the oven, that really turns a house into a home. Above all, it has opened up a lifetime of enjoyment to my children. I hope that this short guide has given you the inspiration and direction needed to take the next step! There is certainly no time like the present to begin your musical journey.